This week I spent more time at home, thus more time in my own kitchen, therefore more time preparing food the origin of which I could know and control. This turns out to be a boon for someone who cares where their food originates. On Monday night I made dinner for a plumb-tuckered Descartes: salmon, green beans, and mashed potatoes. The salmon was a pre-commitment buy from Trader Joe’s, originating in Chile or some crazy far-away place like that. But the rest came from our CSA or the co-op. To the mashed potatoes I added coconut oil, Clover butter, salt & pepper, local thyme, and both yogurt and cheese from my new raw milk suppliers in the foothills. The result was tangy goodness if you ask me; Descartes isn’t partial to the very-sharp cheddar, but I love it. Instead I focused on what I was going to eat that night…that afternoon I had picked up my CSA box to find a bunch of radishes with greens intact for the second week in a row. 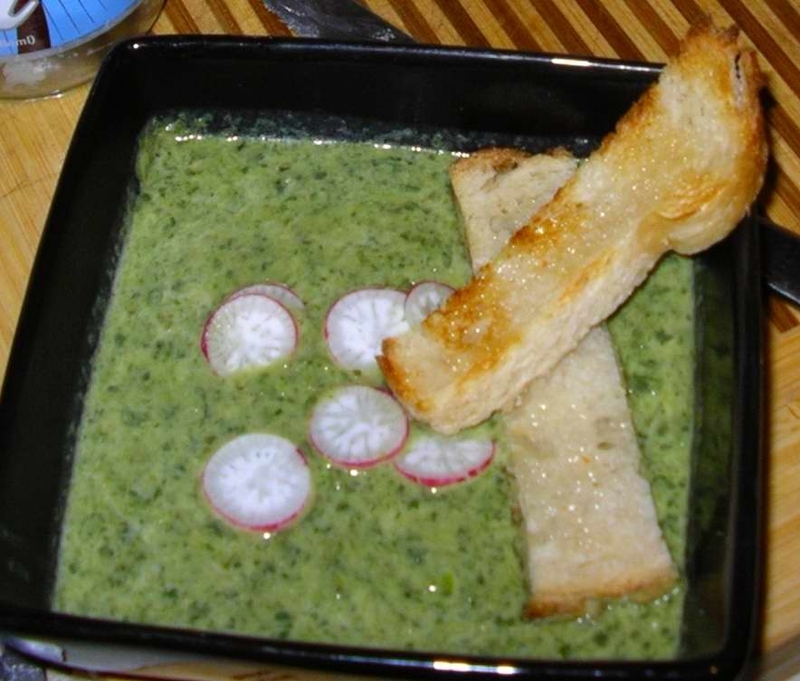 An internet search to figure out clever ways to use radishes turned up an intriguing Radish Greens Soup, which was highly-rated by the one person who rated it. I decided to give it a try – off-the-cuff inspiration from Descartes turned it into a Coconut Curry Greens Soup…delicious. A friend dropped by for a minute, and when he came in he said, “It is your house that smells so good! I can smell it from the street, it smells amazing out there.” I was proud. I couldn’t resist taking a picture of the finished product. My friend found it amusing that I take pictures of dishes that turn out well (especially since I’ve recently recovered my camera). I guess I used to think it was weird, too, before I got a blog. The rest of the week has gone fairly well…not perfect, but better. I think I’m getting the hang of this. More soon!